Horses have always played an important role in the life of Greeks and their importance goes back thousands of years. Ever since the ancient years, equestrianism has existed as a sport and since 600 B.C. and 648 B.C. chariot racing and horse racing have been two of the 10 events of the Olympic Games. Today is it still a much loved activity and a great way to explore and experience the natural beauty and charm of Greece. Over the years the number of people who are taking an interest in horse riding has grown considerably, and it is a sport that is becoming more and more popular, especially with younger participants. In fact, there are over 50 equestrian clubs and riding schools operating throughout Greece, with a large number of them belonging to the Hellenic Equestrian Federation ( HEF ). 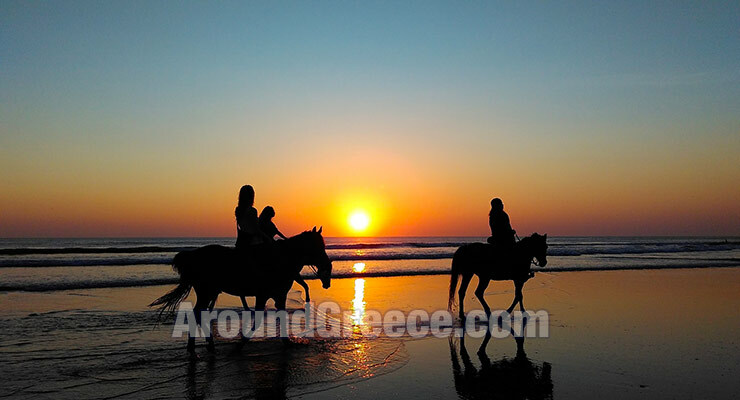 There are a number of riding centers located all around Greece and here you can enjoy horseback riding and also excursions, taking you on wonderful routes along the coast or mountainous areas. All of the horse riding centres have qualified instructors so even if you have never been on a horse before, you will be taught the basics of safe riding. Below you will find an overview of some of the most popular riding centers and schools where you can enjoy horse riding during your holidays to Greece. In Athens you will find the Riding School of Athens, which is the second oldest riding school in Greece and was founded in 1961. The school is located in the area of Gerakas and offers lessons for all ages, starting with children as young as 6 years old, who are introduced to small horses or ponies. On the island of Crete is the Riding Academy of Crete, the largest equestrian center on the island, which is located approximately 5km from the Heraklion international airport. This riding centre has been in operation since 1979 and a number of horses are bred and trained there. You can choose from a number of riding programs such as horse riding treks, dressage, elegant riding and much more. On the Cyclades island of Mykonos is the Horseland riding school which is operated by Fanis Roubas, a professional instructor, breeder and horse trainer. You can enjoy a number of riding excursions such as along the beach of Fokkos, or up to the Castle of Moroegro. The Pelion peninsula in Thessaly is one of the most beautiful locations in Greece and is ideal for visiting any time of the year. It is a place of immense natural beauty and is perfect for enjoying a horseback excursions around the trails and taking in the stunning landscapes and scenery.